A mass shooting at a Kinopolis cinema in Viernheim, Germany, has left 25 people wounded, German public TV reports. One account said several people had been killed and 50 others injured. 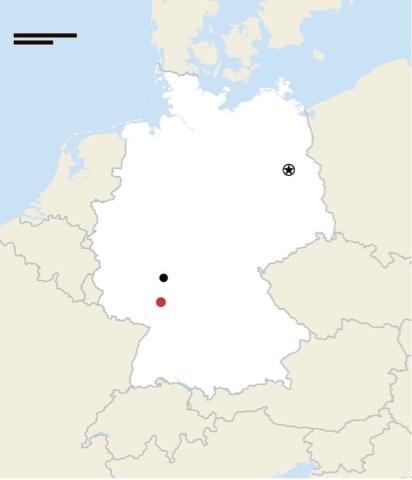 Viernheim (the red dot) is in western Germany, near Frankfurt (the black dot) is southwest of Berlin (the starred dot). At least that was the early report. Later media accounts said people were hurt by tear gas. That news was later withdrawn, as well. A man dressed in a costume, who was taken to be dressed up for a movie, was seen by a popcorn attendant. The masked individual with a rifle asked for the theater to be locked, as he allegedly took hostages and fired four shots into the air. Patrons of the theater were unharmed, despite reports initially to the contrary. No hostages were injured and the gunman was shot and killed by the Spezialeinsatzkommando. Allegedly this all happened as a showing of Zootopia was to begin. It will be recalled Zootopia was the movie that played right before Lane Graves was taken by an alligator, at Disney World, Orlando. Also playing at the theater was Clockwork Orange. On 29 May, it was reported that in Ningbo, China, a Lego-sculpture of Nick Wilde from Zootopia was destroyed by a five-year-old boy. The sculpture had taken three days to complete.